If a tree be known of by its fruit, and a good tree beareth good fruit (Mt. 7: 17; Lk. 6: 44), then is not the Mother of Goodness Itself and the Birth-Giver of Eternal Beauty incomparably more excellent than any good, situated within the world of the natural or the supernatural? Wherefore the Co-Eternal and Immutable Image of the goodness of the Transcendent Father -- the Word Praeternal, Praexistent and Beyond-All-Goodness, through His unutterable love for mankind and compassion for us, aspiring to take our image upon Himself, so as from uttermost hades to draw up our nature unto Himself, and so as to renew this corrupted nature and take it to the heights of Heaven, -- for all this to find that most-good Servant, and Ever-Virgin, Whom we glorify, and Whose miraculous Entrance into the Temple -- into the Holy of Holies, we now celebrate. God predestined Her before the ages to the salvation and uplifting of our kind: She was chosen from amidst the ranks of the chosen of the ages and the glorified both through verymost piety and prudence, and through God-pleasing word and deed. The once author of evil -- the serpent, exalting it over us, did also entice us into its abyss. Many a reason impelled it to rise up against us and enslave our nature: envy, rivalry, hatred, injustice, trickery, slyness, and in addition to all this, also the death-bearing power within him, which he begat, being the first to fall away from true life. The author of evil was jealous of Adam, having seen him aspiring from earth to Heaven, from which through just cause he was cast down, and filled with envy, with a terrible fierceness he pounced upon Adam, he wanted even to attire him with the garb of death. But jealousy -- the begetter not only of hatred, but also murder, which this indeed hater of mankind accomplished over us, with evil having set upon us, whereby with utmost injustice he wanted to be master over the earth-born for the ruination of a creature, created in the image and likeness of God. And since he did not possess sufficient boldness to make a face to face attack, he resorted to cunning and deceit, and having assumed the appearance of a sensual snake, he turned himself to the earth-born, like a friend and useful counsellor, this indeed terrible enemy and malevolent, imperceptibly he passes over into action and by his God-opposing advice and with his own especial death-bearing power, like a venomous poison, he injects it into man. If Adam had been sufficiently strong to keep the Divine commandment, then he would have rendered himself the vanquisher of his enemy and would have come out on top of the deathly defilement. But since, from the one side, he voluntarily gave in to sin, whereby he underwent defeat and was made a sinner; and from the other side, being the source-root of our race, he begat us as still death-bearing offshoots, -- then in order for us to annihilate within ourselves the death-bearing venomed poison of soul and body and find for ourselves eternal life, it was absolutely necessary for our race to have a new tap-root. It was necessary for us to have a new Adam, Who not only would be sinless and absolutely come out the victor, but Who also would be able to forgive sin and set free from the punishment those subject to it. And not only would He be embued with life, but also the capacity to restore to life, so as to make partakers of life those, which cleave to Him and belong to His lineage, and not only those present in the subsequent generations after Him, but also those, which already had died before Him. Wherefore Saint Paul, that great trumpet of the Holy Spirit, doth exclaim: the first man was alive in soul, but the second Man was in spirit life-creating (1 Cor. 15: 45). But except for God, no one is without sin, nor life-creating, nor able to remit sin. Therefore the new Adam must be not only Man, but also God, so that He Himself through Himself would be with life, with wisdom, and truth, and love, and mercy, and altogether with every good for this -- to bring the old Adam into renewal and restoration to life by mercy, by wisdom and truth, set forth in opposition to those means whereof the author of evil has caused death for us. Thus similar is the contrast in this, how that primordial man-killer did lord it over us with envy and hatred, and how the Source of life was lifted up [on the Cross] on account of His immeasurable love for mankind and His goodness. He intensely desired the salvation of His creation, which salvation consisted in this -- to bring anew the creation under Him. In contrast to this the author of evil wanted to bring to ruin the creation of God, and thereby put mankind under his own power, and tyrannically to afflict us. And just as that one gained himself the conquest and the fall of mankind by means of injustice and cunning, by deceit and his trickery, so likewise the Liberator gained Himself the defeat of the author of evil and renewed His creation by means of truth, justice and wisdom. It was a deed of perfect justice so that our nature, which voluntarily was enslaved and struck down, should itself again enter the struggle for victory and overthrow from itself voluntary enslavement. Wherefore it pleased God to take upon Himself of us our nature, in miraculous form co-uniting with it Hypostatically. But the union of the Most-High Nature, the purity of which is incomprehensible for our reason, -- was impossible for a sinful nature before it purify itself. Therefore, for the conception and birth of the Bearer of purity, it was necessary that there should be a Virgin perfectly Immaculate and Most Pure. We now celebrate the memory of this, -- that once formerly was co-operated this Incarnation. Wherein He in nature God, God the Word and Son Co-Eternal and Co-Without-Beginning for the Transcendent Father, is co-actualised with the Son of Man, with the Son of the Ever-Virgin. "Jesus Christ yesterday and today, He is forever" (Heb. 13: 8), immutable in Divinity and immaculate in humanity, He alone only, as the Prophet Isaiah prophesied, "doeth not iniquity, nor is deceit found on His lips" (Is. 53: 9), -- He alone was not conceived in iniquity, and His birth was not into sin, in contrast to which regarding himself and every other man the Prophet David gives testimony (Ps. 50 : 7). He alone was perfectly pure and even had not the need of cleansing for Himself: but rather for our sake He took upon Himself suffering, death and resurrection. God is born of the Immaculate and Holy Virgin, or even better said, of the All-MostPure and All-Holy. This Virgin is not only above every fleshly defilement, but also even above every impure thought, and Her conceiving resulted not from fleshly lust, but by the overshadowing of the MostHoly Spirit. When the Virgin lived completely remote from people and dwelt in prayerful contemplation and spiritual joy, She declared to the announcing Angel: "Behold the HandMaiden of the Lord: be it unto Me according to thy word" (Lk. 1: 38), and having conceived, She gave birth. And so, in order to render the Virgin worthy for this sublime purpose, God from before the ages predetermined from amidst the number of the chosen and at the beginning of time did choose Her, She now praised by us as the Ever-Virgin. Turn your attention then, whence began this choice. From the sons of Adam was chosen by God the wondrous Seth, who through his decent temperament, through being the image of good sense and utmost virtue, did show himself inspired by Heaven, wherefore also he was granted to be chosen, and from whom the Virgin -- the God-like chariot of the Coelestial God -- was needed to give birth and thereof to summon the earth-born to the Heavenly sonship of filiation. For this reason also all the lineage of Seth were named "sons of God": wherefore the Son of God did possess this lineage to be born from; and thus also the name of Seth signifies a getting-up or resurrection (from the dead), which spoken specifically, -- is also the Lord, promising and giving life immortal to believers in His Name. And how precisely exact is this parallel! Seth was born of Eve, as she herself said, in place of Abel, whom Cain killed through jealousy (Gen. 4: 25); and the Son of the Virgin, Christ, born for us in place of Adam, Whom likewise through jealousy the author of evil killed. But Seth did not resurrect Abel: since he served but as a foretype of resurrection. But our Lord Jesus Christ resurrected Adam, since He is for the earth-born the Life and the Resurrection, for which also the descendents of Seth are vouchsafed, through hope, of filiation to God, being called the children of God. And that afterwards in consequence of this hope they were named sons of God, this indicates first suchlike a calling is through inheritance, and receiving this chosenness was the son of Seth -- Enos, who by the report of Moses, first hoped upon this, in order to call on the Name of the Lord (Gen. 4: 26). By such manner, the choice of the future Mother of God, beginning with the very sons of Adam and proceeding through all the generations of time, through the Providence of God, passes through the Prophet-king David and the successors of his kingdom and lineage. When the chosen time was come, then from the house and fatherhood of David there was chosen by God -- Joakim and Anna, who although they were childless, were by their virtuous life and good disposition the finest of all, descended from the line of David. 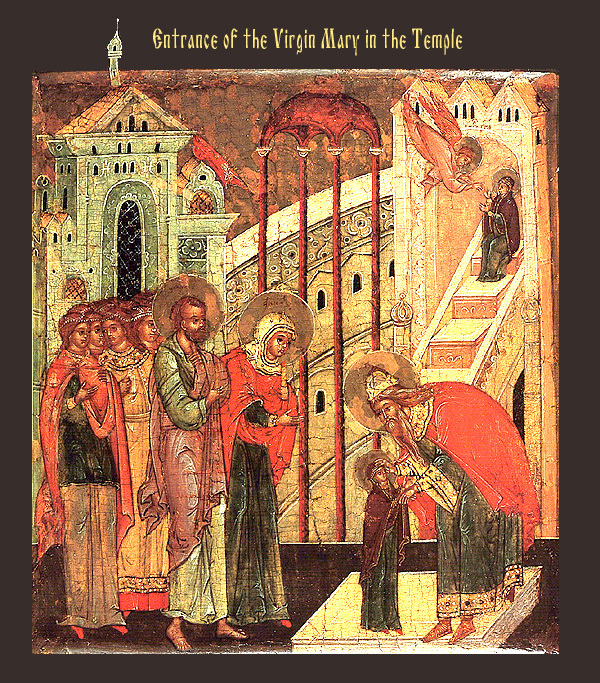 And when in prayer they besought the resolving of their childlessness and promised to dedicate to God the offspring, -- then from Her very childhood, then the Mother of God was proclaimed and given them by God, as a Child, -- so that from such many-virtued parents was conceived the All-Virtuous and All-Pure Virgin. Thus in suchlike manner, it was a conception chaste in unity with prayer, and the All-Pure co-operated as the Birth-Giver of virginity, in the flesh imperishably giving birth to Him Who before the ages was born of God the Father. And when Righteous Joakim and Anna saw that they had been granted their wish and that the Divine promise to them was realised in fact, then they from their end as true lovers of God hastened to fulfill their vow given to God: they have now led into the Temple of God this in truth Child Virgin Mother of God, having just been weaned from milk. And She, in spite of Her tender age, was imbued with Divine gifts and more than the others She comprehended what was being done over Her, and by all Her manner She appeared -- not that they were leading Her into the Temple, but that She Herself through a particular was arriving into the service of God, as though on self-sprouted wings striving towards the sacred and Divine love, being convinced that Her Entry into the Temple -- into the Holy of Holies and dwelling in this Her wished-for destiny. Therefore also the high-priest, seeing that upon the Maiden, more than anyone else, there dwelt Divine grace, wanted to set Her within the Holy of Holies, and he convinced everyone willingly to concur with this. And God assisted the Virgin and sent Her through His Angel mysteried food, thanks to which She was strengthened in nature and was made more pure than the Angels, having for this Heavenly spirits in attendance. And not only once was She led into the Holy of Holies, but was accepted by God for dwelling with Him during the course of Her youthful years: since through Her in due course the Heavenly Abodes were opened and are given for an eternal habitation to believers in Her miraculous birth. Herein is the meaning of why the Chosen amongst the chosen from the beginning of time came to be within the Holy of Holies. Having Her body purer than the most pure by virtue of the spiritual, such that it was able to accept the Hypostatic Word Himself Who is of the Father Without-Beginning, -- the Ever-Virgin Mary, like a Treasure of God, through inheritance now is placed into the Holy of Holies, so that at the necessary time, as it were, to serve towards its enriching and worthy adornment. Wherefore, Christ God also doth glorify His Mother, both before birth, and also through birth. We however, contemplating the co-operating of salvation for our sake through the MostHoly Virgin, do render Her thanks and praise. And truly, if the thankful woman (about whom the Gospel tells us), having heard some saving words of the Lord, did render thankfulness to His Mother, her voice rising above the din of the crowd and saying to Christ: "Blessed is the womb that beareth Thee, and the paps Thou hast suckled" (Lk. 11: 27), -- then beyond this even moreso ought we as Christians, who have the imprint of the words of eternal life in our hearts and not only the words, but also the miracles and the Passion, and through them the restoration from death of our nature, and the ascent from earth to Heaven, and the promise to us of immortal life and unfailing salvation, -- then after all this ought we not all the more to glorify and unceasingly to bless the Mother of the Author of Salvation and the Bestower of Life, celebrating Her conception and birth and now Her Entry into the Temple -- into the Holy of Holies. We shall move on, brethren, from the earthly mountain, we shall transfer from flesh to spirit, by preference a perpetual not an temporal desire. We shall give up the needed scorn of fleshly delights, which serve as allurements against the soul and soon wilt pass away. Let us desire spiritual gifts, which exist imperishably. Let us avert our reason and our attention from earthly concerns and raise it to the Heavenly sublimity -- to the Holy of Holies, where now the Mother of God doth reside. Wherefore in such manner our song and prayers with God-pleasing boldness and profit will reach Her, and we in gratitude for Her intercession, together with the present blessings we do co-opt the inheritance of future everlasting blessings, through the grace and love for mankind born for us of Her -- our Lord Jesus Christ, to Whom be glory and majesty, honour and worship together with His Father Without-Beginning and His Life-Creating Spirit, now and ever and unto ages of ages. Amen.